You can switch volume modes under: Player > Volume. You can also click the little speaker to the left of the volume slider to access the same menu (as is shown to the right). System Volume controls the master volume of the entire system. It is equivalent to clicking the volume system icon and adjusting the slider. Application Volume controls the volume of only Media Center. This requires Windows Vista and newer. It is not recommended for the best sound quality because it adds another volume layer. Disabled Volume disables any volume controls. This mode is useful if you send audio to an external device with a hardware volume, and you want to avoid the complexity of two volumes. Internal Volume applies volume inside the 64bit JRiver audio engine. This is the highest quality possible software volume. More on 64bit processing here Audio Bitdepth. Internal Volume is useful in cases when hardware does not offer a volume, which is common with high-end sound cards and DACs. As with any audio processing, Internal Volume does not work when bitstreaming. It also does not work with web browser based playback like Netflix. The decibel scale used for Internal Volume is detailed in this Interact Thread. There is no best volume mode. The selection depends on your hardware and preference. The most common choices are System Volume or Internal Volume. The determining factor in this decision is the type / quality of your hardware volume. Sometimes turning up the hardware volume increases the noise you hear if you play silence (use 'Tools > Advanced Tools > Audio Calibration > Silence', and make sure 'Do not play silence' is not checked in Options > Audio). Test this by putting your ear right next to the speaker and adjust the System Volume while silence plays. Volume Protection is a feature to prevent unexpectedly loud output. It is useful in cases where you connect Media Center to a high-gain amplifier where unexpected output at full volume could damage equipment or your ears. In Options > Startup, there are a few volume related options under the header 'Startup Volume'. Optimize volume for best sound quality This option maximizes the wave-out volume slider on startup. This prevents double volume and related sound quality issues on Windows XP and earlier. The option is harmless but unnecessary on Vista and newer. 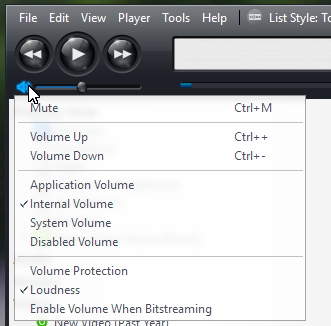 Set volume This option will set the volume in Media Center to the specified level when launching the program. Internal Volume is particularly useful if you perform signal processing like Convolution, Equalization, Linkwitz, etc. Any volume reduction will be available as extra signal headroom, reducing the chances of unwanted clipping or volume reductions from Clip Protection. Imagine that use convolution, which in rare cases outputs at +6dB (so over 100% peak level). If you use System Volume, this +6dB will either have to be flat-lined (leading to audible distortion), or Clip Protection will engage and turn the volume of all channels down (also undesirable). If you instead use Internal Volume, it's likely you will have headroom to avoid any clipping or volume reduction. For example, if you normally listen at -12dB, you could accommodate up to +12dB before there is any need for clipping or volume reductions. Loudness provides a more natural sounding volume control based on the frequency response characteristics of human hearing. It was added to MC18. If you use Internal Volume, you may want to calibrate the volume control so that the zero point matches the "reference level." After this, the volume display will always be relative to this 'reference level.' This reference level will also be used if you enable 'Loudness'. This procedure requires Media Center 18.0.108 or newer for proper test clip creation.